My life on the B List......and 3 give aways (THREE!) - Stop staring and start sewing! So I'm on The Book List. I'm happy because every few weeks I get a new book in my mailbox and it's like a little slice of Christmas each time. The folks at FW Media have been graciously sending me these books and I've been graciously happy about them. I have a feeling, though, they want a little reciprocation so in order to not lose my status on their list I'm doing a review of each of the 3 books I've received recently. I already reviewed Kay Whitt's book here so you can go read that if you like. Here's goes! I recently received Stitch by Stitch which is written by Deborah Moebes of Whipstitch fame (run over there if you want a signed copy!). 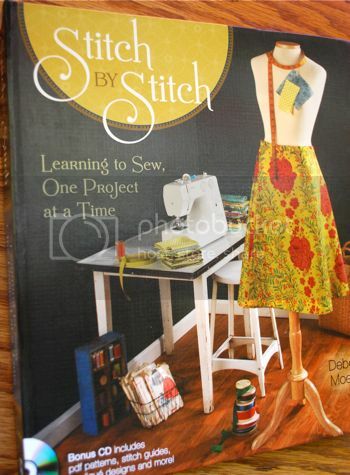 This book is geared toward beginners and she really nails it with the guides for sewing machines, notions, fabrics, etc. (things that come second nature when you've been at it awhile but can really throw a beginner into fits of overwhelmed confusion and perhaps rage). 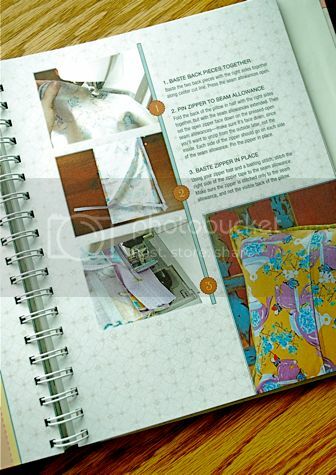 She writes in a very cozy and personable way and includes a little journaling area and "history of sewing" timeline. The pictures are great which I believe is very important since crafty folks are always drawn to beautiful things (you can't judge a book by it's cover but sometimes I'll buy a book because of it's cover). There is a CD in the back that includes some nice guides and the printable patterns so if your kids spill water on your pattern pieces you don't have to cry, you can just print it again! There are 11 projects in here and every one of them is stylish and practical. I love the hardcover with spiral spine aspect of it. Good for a book you'll want to keep for years. Perfect for beginners or those wanting a simple but thorough resource book. Full of clear and detailed photographs. Very useful and stylish projects sewn in great fabrics. Writing style is very friendly and encouraging. The only thing I'm not crazy about is the cover. It reminds me of something we would have had in our house in the 70's but you youngsters may find it to be the cats pajamas (that means nifty neato or totally rad). Just a personal thing (the 70's are still too vivid to be in my "retro" catagory yet). If I were to buy a book for a beginning sewer, this one would definitely be it! This book will definitely stand the test of time. Here's a look at one of my favorite projects (I'm a complete sucker for Bari's teapot fabric). This is a project anyone would want to do again and again (including the instructions for making your own piping). 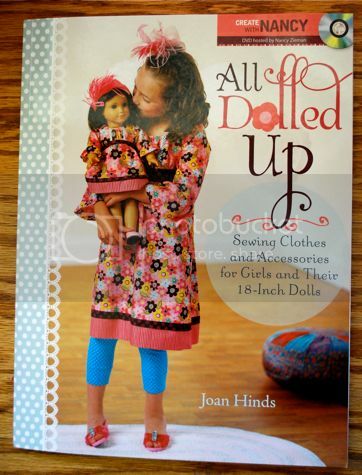 Another book I've received is All Dolled Up by Joan Hinds. She's quite the expert at making doll clothes and this is one of many books she's written. 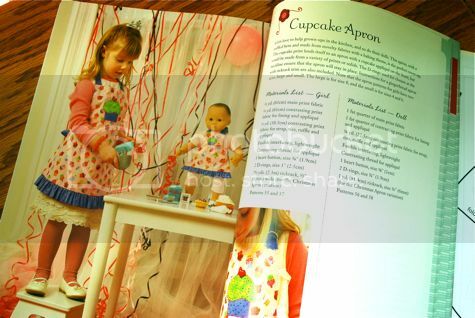 This book has 20 different projects for girls and their 18" dolls (go ahead and say it...American Girl Dolls). It's very beginner friendly and has very detailed materials lists and all the patterns included in the back. There is also a DVD filled with techniques to help you make your outfits in a short amount of time. This is a book I would have definitely used back when my girls were playing with their American Girl Dolls (instead of begging for Facebook accounts). It includes casual wear as well as things that are a bit more dressy (good for parties or church). Lots of projects and some are very good for teaching your girls to sew. The drawings are wonderful. Very cute and detailed. Includes lots of little techniques thrown in. Some nice "re-purposing" projects you can do with clothing you already have. You'll save yourself oodles of money on this since AG clothes are killer expensive (with a little imagination you can use these patterns to re-create a lot of the same looks). Nice photographs but lacking that "hip factor". The projects would look much more stylish in some more recent designer fabrics (yes, I know I own a fabric store but I'm trying to be objective here). You'll snag the grandma's with this book but will have a harder time catching the eyes of today's younger sewists. A great book for grandma's and young moms (even those who are beginners) with some nice techniques and room for you to "make it your own". 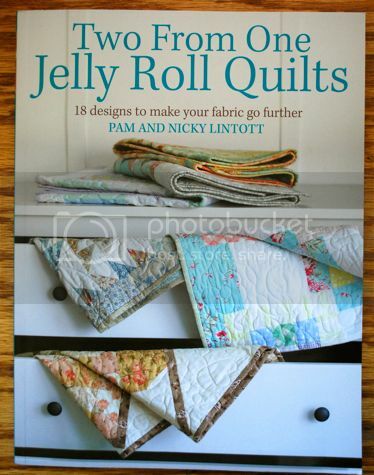 Okay, book number three is Two From One Jelly Roll Quilts by Pam and Nicky Lintott (mother and daughter). This book has patterns for 18 quilts (2 quilts from each jelly roll!). They are all lap size or crib sized quilts so I'm thinking they're pretty quick projects for the experienced quilter. As a beginning quilter I would just gobble this book up because it's loaded with great pictures and impeccable instructions for describing techniques I've never tried (there's a lot of "ooohhh, that's how they make it look like that" coming from me while flipping through this). Very pretty and fresh pictures throughout. Many of these fabrics can still be found in stores (if not I'm sure you can find something current with a similar look by the fabric designers included). Detailed instructions and a terrific conversion chart in the back to help you if you're not using a jelly roll pack (and also help for calculating the fabric for the backing). I really love everything about this book but need to find a con (it's only fair). The only thing I would do to improve on it is to add a spiral spine so I could open it to any one of the pretty pictures and leave it sitting on a coffe table (I'd flip to a new picture every few days. 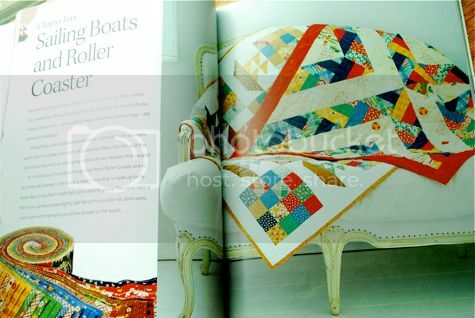 This book is very pretty and full of great, stylish quilts. It's a treat to flip through because it's loaded with beautiful fabrics. Very beginner friendly. Okay, if you sat through that then you deserve a treat! I'm giving all three of these books away since I've been a poo poo blogger lately. Most of my patterns are going to the printers today and the pattern pieces for the Sunny Scallop Dress are arriving tomorrow for me to proof so I've been very distracted lately. Just leave a comment and let me know which of these books you'd be more likely to want in your sewing library and why (don't feel like you have to elaborate, I'm just curious). I'll pick three random winners later this week (first winner gets first choice and so on...). Have a wonderful week and keep on sewing!